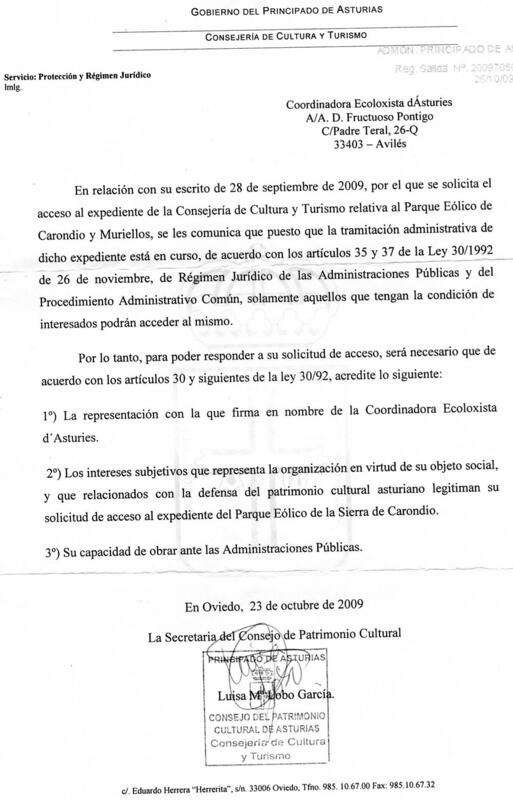 Os adjuntamos la carta certificada que nos acaba de llegar. Es una vergüenza las trabas que se nos pone, solo para tomar vista. The subjective interests inherent to the Group and its mandate, and which, in their relation to the preservation of the historic legacy of Asturias, justify its request to view the file of the wind farm at Mt. Carondio. The ability of the Group to deal with the Asturian regional administration. Attached is the original letter so you can judge for yourself. It's outrageous to see the kind of barriers they impose on us. En esta pagina puedes leer el recurso contra el plan por la Coordinadora ecoloxista d'Asturias.